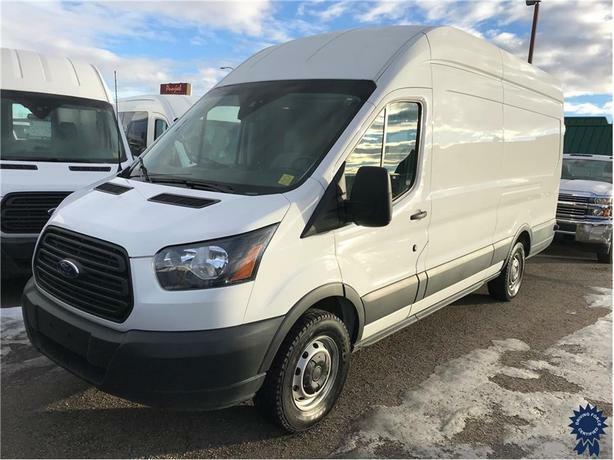 This 2018 Ford Transit T-250 Extended Length High Roof Cargo Van comes with a 148-inch wheelbase, 6-speed automatic transmission with over-drive and SelectShift, 4.10 axle ratio, vinyl front bucket seats, engine oil cooler, block heater, 150-amp alternator, HD shock absorbers, front anti-roll bar, 16-inch steel wheels, black grille, light tinted glass, power door locks, remote keyless entry, manual air-conditioning, three 12V DC power outlets, low tire pressure warning system, backup camera, cargo space lights, 3,510 lbs Maximum Payload, and GVWR rating of 9,000 lbs (4,090 kgs). The 3.7-litre V6 gas engine provides 275 horsepower at 6,000 RPM and 260 lb-ft of torque at 4,000 RPM. Touch base with us to discuss purchasing or financing options that are right for you and experience the difference you will only find at DRIVING FORCE Vehicle Rentals, Sales and Leasing.